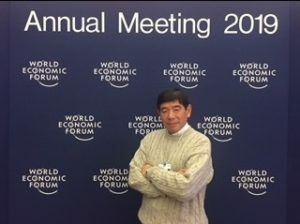 At the invitation of the World Economic Forum (WEF), WCO Secretary General Kunio Mikuriya participated in the Annual Meeting 2019 held from 22 to 25 January 2019 in Davos-Klosters, Switzerland, where he met with global leaders, explained the important role played by Customs and contributed to various sessions. Under the overarching theme of «Globalization 4.0: Shaping a Global Architecture in the Age of the Fourth Industrial Revolution», data governance was one of the focus areas of the discussions held throughout the Annual Meeting. Secretary General Mikuriya addressed trade ministers and business leaders on the WCO’s digital Customs initiatives, including the collection and analysis of data, cross-border e-commerce and the use of disruptive technology at borders. Secretary General Mikuriya emphasized revenue and security concerns, stressing the Customs community’s willingness to facilitate legitimate trade while focusing on the ensuing benefits for micro-, small- and medium-sized enterprises as well as for consumers. In addition, Dr. Mikuriya described how the WCO encourages Customs administrations to improve the business environment through the use of performance measurement. By way of example, he referred to the WCO’s efforts to facilitate the Customs community’s engagement with the World Bank’s «Ease of Doing Business» survey, and to identify ways of addressing bottlenecks in border procedures by means of dialogue with business. Dr. Mikuriya took part in bilateral meetings with ministers, heads of government, international organizations and global businesses, raising Customs’ profile among world leaders as a result. The high-level participants welcomed the WCO’s input to the sessions and its collaboration through a range of initiatives. Copyright © 2019 Российская таможенная академия: НАУКА . All Rights Reserved.